It is often the unexpected, unpredictable things in life that make all the difference. Such was the case for Thomas Farms in Corinth, Maine. In 2000, Frank Thomas found himself in the hospital with a staph infection. It was harvest time, and 300 acres of chip potatoes sat in the field. The family hired a replacement harvester who bruised the produce so badly that the chip company immediately cancelled the Thomas’ contract. That calamity was the impetus for a shift in the Thomas’ business model. Frank and his son, Paul, began transitioning from a monoculture to diversified vegetable production. It was a challenge at first. Paul worked summers hauling roll-off dumpsters to pay the bills. Things started to change after Paul negotiated his first sale to a Hannaford in Bangor. From that one market they have grown to supplying 17. Paul attributes the increase to one thing: “It’s having the best service.” His customers know within a one-hour window what time the delivery truck will show up each day. When the produce appears, customers also know that the quality will meet their expectations or it will be replaced. No questions asked. Should demand significantly surpass expectations, Paul is willing to send additional produce later in the day. Thomas Farms also runs two farm stands: one in Bangor and one on the home farm. A significant success of the farm stands has been participation in Senior Farm Share. Operated by the State of Maine, farms can apply for an allotment of seniors. Thomas currently has 300 senior shares that the State pays for at the beginning of the season. Each senior then receives a $50 coupon book to “spend” at the farm. If a farm can’t use their shares, the shares get distributed to other farms. Participating farms can manage the senior shares according to their preferences. At Thomas Farms, seniors have free choice of any products grown on the farm. Thomas Farms currently grows about 250 acres of vegetables including sweet corn, squash, pumpkins, beans, peas, potatoes… and rutabagas. When discussing produce availability, one of their markets asked about rutabagas. Thomas Farms wasn’t growing them at the time. A nearby farmer dominated the market. When that farmer decided to sell out four or five years ago, Frank and Paul purchased his equipment, acquired his customers, and began supplying Hannaford. Thomas Farms is now the largest rutabaga grower on the East Coast. One of the biggest concerns in vegetable production is having a consistent supply of water. 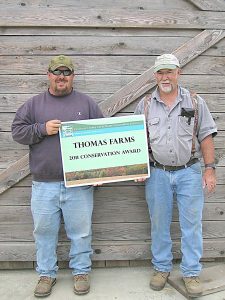 To that end, Thomas Farms has worked closely with the Natural Resources Conservation Service (NRCS). Frank did his first NRCS project in 1973. Four decades later, their farm boasts several irrigation ponds connected by a mile of underground pipes, three sets of center pivots, and the ability to pump water from one pond to another as needed. Cooperative agreements — with neighbors as well as NRCS — are something of a hallmark for Thomas Farms. Paul is a self-proclaimed “wheeler-dealer,” and his deals pay off. He is partly able to grow the volume of squash and pumpkins he does because a neighbor and he share land, rotating corn with the cucurbits which are notorious for developing disease issues if continuously cropped on the same land. Paul and a friend, Josh Campbell, have teamed up to rebuild tractors. They are also partners in a fledgling hay business. The haying actually started as a result of Paul’s daughter’s ‘pets’: horses, Norwegian dwarf goats, donkeys and chickens. He wanted to defray the feed costs. Now he has several thousand bales of high-quality horse hay for sale. While the diversity in the current operation can be exciting, the pace of mixed vegetables is often frenetic, particularly around Thanksgiving. Paul commonly works 15-hour days then, as it is the busiest shipping time of the year. All of the crops are harvested by hand except the beans, potatoes and rutabagas. It takes 25-30 part-time, seasonal employees to fill orders on time. Due to the enormous time requirements in the existing system, Paul is considering scaling back and modifying crops down the road. He has a daughter and two step-daughters, and making time for them is a priority. He asserts, “I’m not missing my daughters lives.” With Paul’s knack for negotiation and creativity, his future promises to be as bright as his past.